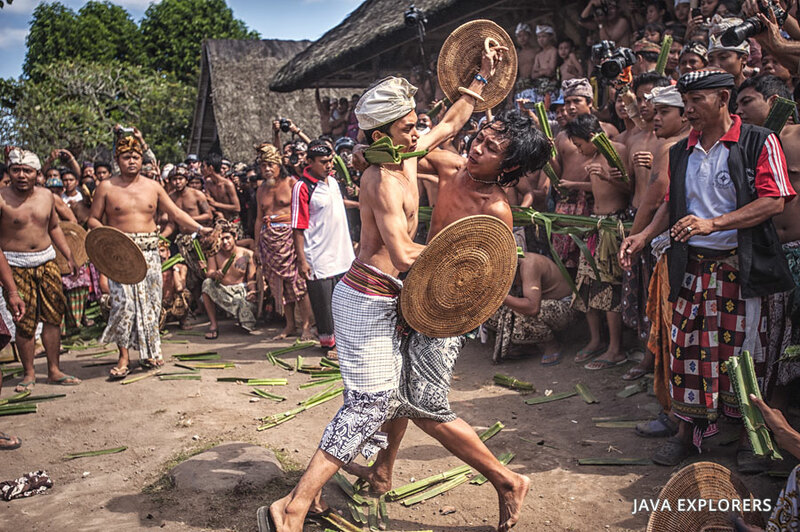 Bali has various unique traditions, all tradition still keep by the Balinese people until now. One of the tradition is MEKARE- KARE or Famous name Perang Pandan ( Pandan War ). 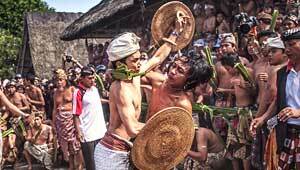 This tradition still keep by people who stay at Tenganan Village at Rengency of KARANG ASEM ( East Bali ). According to the Story, in the ancient times and the surrounding area Tenganan ruled by a king named Maya Denawa the unjust and cruel , he even made himself as God and forbid the Balinese perform religious rites , hear that the gods in heaven was angry , and the gods sent Lord Indra to resuscitate or destroy Maya Denawa , Lord Indra by lifting as commander of commanders of war or battle . Through fierce fighting and casualties were not the least , the end of the Mayan Denawa can beat her. War ceremony Pandan / Mekare curry was held 2 days and is held once a year on 1 sasih kalima ( the fifth month of the Balinese calendar ) and is part of the ceremony Sasih Worship is the biggest religious ceremony in the village of Tenganan.Tempat the ceremony Mekare - kare is in front meeting hall in the village yard . 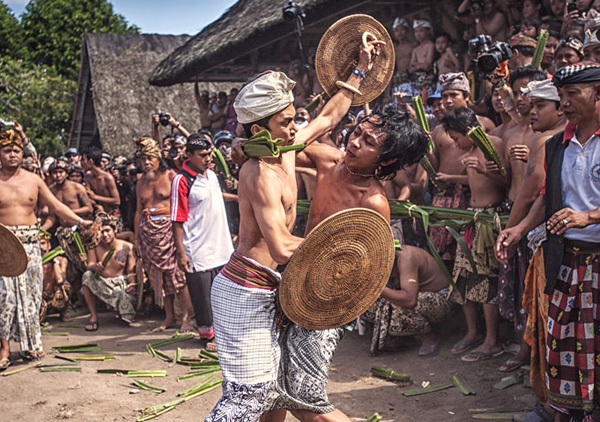 Execution time usually begins at 2 pm in which all citizens using custom clothing Tenganan ( Pegringsingan woven cloth ) , for men only use gloves ( Kamen ) , scarves ( saput ) and headband ( udeng ) no shirt , shirtless . This war equipment is tied into the thorny pandanus shape of a mace , while the shield is made of rattan. Every man ( started up teen ) this village shall participate in the implementation of Pandan War , the stage is about 5 x 5 square meters . With a height of about 1 meter , with no safety rope surrounds .